Disclosed herein is a cosmetic composition comprising, in a physiologically acceptable aqueous medium: at least one agent for protecting keratin fibers; at least one aromatic alcohol; and at least one aromatic carboxylic acid or a salt thereof. Also disclosed herein is a method for protecting keratin fibers against the action of atmospheric agents comprising applying the composition above to fibers. Further disclosed herein is a method for the post-treatment of an oxidation dyeing or of a direct dyeing operation on keratin fibers comprising applying the composition described above to the fibers. This application claims benefit of U.S. Provisional Application No. 60/651,515, filed Feb. 10, 2005, the contents of which are incorporated herein by reference. This application also claims benefit of priority under 35 U.S.C. §119 to French Patent Application No. 05 50142, filed Jan. 18, 2005, the contents of which are also incorporated herein by reference. Disclosed herein is a composition for treating keratin fibers, such as the hair, comprising, in a physiologically acceptable, for example, a cosmetically acceptable aqueous, medium, at least one aromatic alcohol, at least one aromatic acid, and at least one protecting agent. Also disclosed herein is a method for treating keratin fibers, for example, the post-treatment of a direct or oxidation dyeing operation, comprising applying the composition of the present disclosure to the keratin fibers. It is well known that the hair is sensitized and/or embrittled to varying degrees by the action of atmospheric agents, for example, light. Many publications disclose that natural light destroys certain amino acids of the hair. These attacking factors may impair the hair fiber and reduce its mechanical properties, for instance the tensile strength, the breaking load and the elasticity, and/or its resistance to swelling in an aqueous medium. The hair is then dull, coarse, and/or brittle. It is also known that light especially has a tendency to attack the natural color of the hair, and also the artificial color of dyed hair. The color of the hair gradually may fade or turn to relatively unattractive or undesirable shades. The effect of light may be even more visible on hair dyed by artificial coloration, for example, oxidation dyeing and direct dyeing. In this case, exposure to light may lead to degradation of the dyes present both in the hair and on its surface. This results in substantial fading and/or changing of the color of the hair. Substances for protecting the hair against the degradation caused by atmospheric attacking factors, such as light, have been sought for many years in the cosmetics industry. Products that protect the integrity of keratin fibers, i.e., their composition, their surface condition, their natural or artificial color and their intrinsic mechanical properties (the tensile strength, breaking load and elasticity, and/or their resistance to swelling in an aqueous medium) would be desirable. To combat these types of degradation of hair keratin, it has been proposed to use protecting agents such as organic UV-screening agents, antioxidants, chelating agents, and/or free-radical scavengers. Certain substances capable of screening out light radiation, for instance 2-hydroxy-4-methoxybenzophenone-5-sulfonic acid and salts thereof (discussed, for example, in French Patent Application No. 2 627 085), 4-(2-oxo-3-bornylidenemethyl)-benzenesulfonic acid or salts thereof (discussed, for example, in European Patent Application No. 0 329 032), and lactoferrin (discussed, for example, in French Patent Application No. 2 673 839) have thus been proposed. Japanese Patent Application No. 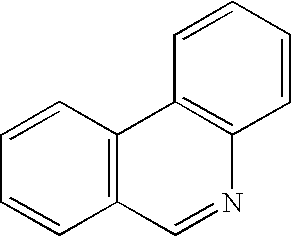 05-043 437 discloses dye compositions containing 2-hydroxy-4-methoxybenzophenone-5-sulfonic acid and salts thereof, an aromatic alcohol, and an acidic direct dye. However, the current cosmetic compositions containing protecting agents are not always entirely satisfactory, in particular on hair dyed with blue oxidation dyes, for instance those obtained with couplings comprising meta-phenylenediamines. The present inventors have now discovered, surprisingly, that aqueous compositions comprising a combination of an aromatic alcohol, an aromatic carboxylic acid, and a protecting agent may give the hair better protection against the harmful effects of light. An improvement in the light-fastness of the coloration of hair dyed by direct dyeing or oxidation dyeing may be observed. c) at least one aromatic carboxylic acid or a salt thereof. Also disclosed herein is a method for treating keratin fibers, such as the hair, and/or protecting keratin fibers against atmospheric agents, comprising applying to the keratin materials a cosmetic composition as defined above, and then optionally rinsing with water. The present disclosure also relates to the use of a composition as defined above in the preparation of a cosmetic formulation for protecting keratin fibers against the action of atmospheric agents. Further disclosed herein is a method for the post-treatment of an oxidation dyeing or a direct dyeing operation on keratin fibers, such as the hair, comprising applying a composition as defined above to the keratin fibers. Still further disclosed herein is a dyeing process comprising applying to human keratin fibers, such as the hair, a direct or oxidation dye composition (A) for a time that is sufficient to develop the color, and, after optionally rinsing and optionally drying, by subsequently applying a composition (B) comprising a composition as defined above. Other characteristics, aspects, subjects, and advantages of the present disclosure will emerge even more clearly on reading the description and the examples which follow. All of the meanings and definitions of the compounds presented herein are valid for all of the subjects of the present disclosure. The physiologically acceptable, and in at least one embodiment, cosmetically acceptable, medium may comprise water, at least one aromatic alcohol and at least one aromatic carboxylic acid. It may comprise at least one cosmetically acceptable organic solvent other than aromatic alcohols and aromatic carboxylic acids. Examples of cosmetically acceptable organic solvents include, but are not limited to, C1-C4 lower alcohols, for instance, ethanol, isopropanol, tert-butanol, and n-butanol; polyols, for instance, propylene glycol, glycerol, diethylene glycol, and polyol ethers. In at least one embodiment, the cosmetically acceptable organic solvent may be ethanol. The agent for protecting keratin fibers may be any active agent that is useful for preventing or limiting the degradation of keratin fibers, such as the hair, caused by atmospheric attacking factors, for example, light. The agent for protecting keratin fibers may be chosen from organic UV-screening agents, free-radical scavengers, and antioxidants. As used herein, the term “free-radical scavenger” means any compound capable of trapping free radicals. The organic UV-screening agents (systems for screening out UV radiation) may be chosen from water-soluble or liposoluble, silicone or non-silicone screening agents. The organic screening agents may be chosen, for example, from dibenzoylmethane derivatives; anthranilates; cinnamic derivatives; salicylic derivatives; camphor derivatives; benzophenone derivatives; β,β-diphenylacrylate derivatives; triazine derivatives; benzotriazole derivatives; benzalmalonate derivatives; benzimidazole derivatives; imidazolines; bis-benzazolyl derivatives, described, for example, in European Patent No. 0 669 323 and U.S. Pat. No. 2,463,264; p-aminobenzoic acid (PABA) derivatives; benzoxazole derivatives, described, for example, in European Patent Application Nos. 0 832 642, 1 027 883, and 1 300 137 and German Patent Application No. 101 62 844; screening polymers and screening silicones such as those described in International Patent Application Publication No. 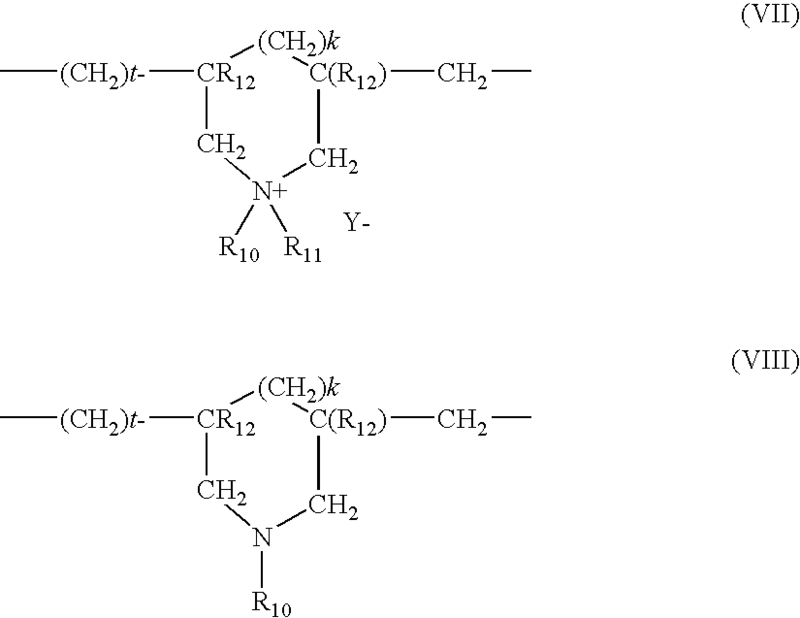 WO 93/04665; dimers derived from (α-alkyl-styrene, such as those described in patent application DE 198 55 649; 4,4-diarylbutadienes such as those described in European Patent Application Nos. 0 967 200, 1 008 586, 1 133 980, and 1 133 981, and German Patent Application Nos. 197 46 654 and 197 55 649, and mixtures thereof. PEG-25 PABA, sold, for example, under the name “Uvinul P25” by BASF. Isopropyldibenzoylmethane sold, for example, under the trade name “Eusolex 8020” by Merck. Dipropylene glycol salicylate sold, for example, under the name “Dipsal” by Scher, and TEA salicylate sold, for example, under the name “Neo Heliopan TS” by Haarmann and Reimer. Etocrylene sold, for example, under the trade name “Uvinul N35” by BASF. Polyacrylamidomethylbenzylidenecamphor manufactured, for example, under the name “Mexoryl SW” by Chimex. Disodium phenyl dibenzimidazole tetrasulfonate sold, for example, under the trade name “Neo Heliopan AP” by Haarmann and Reimer. Methylenebis(benzotriazolyl)tetramethylbutylphenol sold, for example, in solid form under the trade name “MIXXIM BB/100” by Fairmount Chemical, or in micronized form as an aqueous dispersion, for example, under the trade name “Tinosorb M” by Ciba Specialty Chemicals. Menthyl anthranilate sold, for example, under the trade name “Neo Heliopan MA” by Haarmann and Reimer. 2,4-bis[5-(1-dimethylpropyl)benzoxazol-2-yl(4-phenyl)imino]-6-(2-ethylhexyl)imino-1,3,5-triazine sold, for example, under the name Uvasorb K2A by Sigma 3V, and mixtures thereof. Free-radical scavengers that may be used in the composition according to the present disclosure may comprise, besides certain antipollution agents mentioned above, vitamin E and derivatives thereof such as tocopheryl acetate; bioflavonoids; coenzyme Q10 (ubiquinone); enzymes, for instance, catalase, superoxide dismutase and wheatgerm extracts containing it, lactoperoxidase, glutathione peroxidase, and quinone reductases; glutathione; benzylidenecamphor; benzylcyclanones; substituted naphthalenones; pidolates; phytanetriol; gamma-oryzanol; guanosine; lignans; and melatonin. Examples of antioxidants include, but are not limited to, phenols such as BHA (tert-butyl-4-hydroxyanisole), BHT (2,6-di-tert-butyl-p-cresol), TBHQ (tert-butylhydro-quinone), polyphenols such as proanthocyanidol oligomers and flavonoids, hindered amines known under the generic term HALS (Hindered Amine Light Stabilizer) such as tetraaminopiperidine, erythorbic acid, polyamines such as spermine, cysteine, glutathione, superoxide dismutase, and lactoferrin. In at least one embodiment, the agents for protecting keratin fibers may be chosen from organic UV-screening agents. According to the present disclosure, the agent(s) for protecting keratin fibers may be present in the composition in an amount ranging from 0.2% to 20% by weight relative to the total weight of the composition. According to one embodiment of the present disclosure, protecting agents that have a log P (octanol/water partition coefficient) of less than 9, such as less than 4, may be used. According to another embodiment of the present disclosure, protecting agents that are soluble in the aqueous medium of the composition, for example, protecting agents that are at least 0.5% soluble in water and C1-C4 lower alcohols such as ethanol, at 25° C., may be used. In one embodiment, water-soluble organic UV-screening agents such as Benzophenone-4 may be used. The hair compositions according to the present disclosure may comprise at least one aromatic alcohol. As used herein, the term “aromatic alcohol” means any compound that is liquid at room temperature and atmospheric pressure, comprising at least one entity chosen from benzene and naphthalene rings and at least one alcohol function (OH) directly linked to the ring or linked to at least one substituent of the ring. In at least one embodiment, the alcohol function may be on a substituent of the benzene or naphthalene ring. In at least one embodiment, the at least one aromatic alcohol may be benzyl alcohol. According to the present disclosure, the at least one aromatic alcohol may be present in the composition in an amount of greater than 1% by weight relative to the total weight of the composition. The compositions according to the present disclosure may also comprise at least one optionally salified aromatic carboxylic acid. As used herein, the term “aromatic carboxylic acid” means any compound comprising at least one entity chosen from benzene and naphthalene rings and at least one carboxylic acid function (COOH), in free or salified form, directly linked to the ring or linked to at least one substituent of the ring. In at least one embodiment, the acid function may be directly linked to the benzene or naphthalene ring. Non-limiting examples of aromatic carboxylic acid salts include alkali metal (for example, sodium and potassium) and alkaline-earth metal (for example, calcium and magnesium) salts, organic amines, and ammonium salts. In at least one embodiment, the at least one aromatic carboxylic acid may be benzoic acid. According to the present disclosure, the at least one aromatic carboxylic acid and salts thereof may be present in the composition in an amount ranging from 0.001% to 30% by weight, for example, from 0.01% to 20% by weight, or from 0.1% to 10% by weight relative to the total weight of the composition. The compositions according to the present disclosure may also comprise at least one conditioning agent. As used herein, the term “conditioning agent” means any agent whose function is to improve the cosmetic properties of the hair, for example, the softness, disentangling, feel, smoothness, and/or static electricity. The conditioning agents may be in liquid, semi-solid, or solid form, for example, oils, waxes, and gums. According to the present disclosure, the conditioning agents may be chosen from synthetic oils such as polyolefins, plant oils, fluoro oils, perfluoro oils, natural waxes, synthetic waxes, silicones, non-polysaccharide cationic polymers, ceramide compounds, cationic surfactants, fatty amines, fatty acids and derivatives thereof, and mixtures thereof. of hydrogenated or non-hydrogenated polybutene type, for instance, of hydrogenated or non-hydrogenated polyisobutene type. In at least one embodiment, the synthetic oil may be chosen from isobutylene oligomers with a molecular weight of less than 1000 and mixtures thereof with polyisobutylenes with a molecular weight of greater than 1000, for example, ranging from 1000 to 15000.
of hydrogenated or non-hydrogenated polydecene type. Such products are sold, for example, under the names Ethylflo by the company Ethyl Corp. and Arlamol PAO by the company ICI. The animal or plant oils may be chosen from sunflower oil, corn oil, soybean oil, avocado oil, jojoba oil, marrow oil, grapeseed oil, sesame oil, hazelnut oil, fish oils, glyceryl tricaprocaprylate, and plant or animal oils of formula R9COOR10, in which R9 is chosen from higher fatty acid residues comprising from 7 to 29 carbon atoms and R10 is chosen from linear or branched hydrocarbon-based chains comprising from 3 to 30 carbon atoms, such as alkyl and alkenyl, for example, purcellin oil and liquid jojoba wax. It is also possible to use natural or synthetic essential oils, for example, eucalyptus oil, lavendin oil, lavender oil, vetiver oil, Litsea cubeba oil, lemon oil, sandalwood oil, rosemary oil, camomile oil, savory oil, nutmeg oil, cinnamon oil, hyssop oil, caraway oil, orange oil, geraniol oil, cade oil, and bergamot oil. The waxes may be natural (for example, anirhal and plant) or synthetic substances that are solid at room temperature (20-25° C.). They may be insoluble in water, soluble in oils, and may be capable of forming a water-repellent film. An example of the definition of waxes may be found, for example, in P.D. Dorgan, Drug and Cosmetic Industry, December 1983, pp. 30-33. The at least one wax may be chosen in particular from carnauba wax, candelilla wax, alfalfa wax, paraffin wax, ozokerite, plant waxes such as olive tree wax, rice wax, hydrogenated jojoba wax, and the absolute waxes of flowers such as the essential wax of blackcurrant flower sold by the company Bertin (France), animal waxes such as beeswaxes, and modified beeswaxes (cerabellina). Other waxes or waxy starting materials which can be used according to the present disclosure include, for example, marine waxes such as the product sold by the company Sophim under the reference M82, and polyolefin waxes, for example, polyethylene waxes. In at least one embodiment, the conditioning agents may be chosen from cationic polymers and silicones. The non-saccharide cationic polymers that may be used in accordance with the present disclosure may be chosen from all those already known to improve the cosmetic properties of hair treated with detergent compositions, for example, those described in European Patent Application No. 0 337 354 and French Patent Application Nos. 2 270 846, 2 383 660, 2 598 611, 2 470 596, and 2 519 863. As used herein, the term “non-saccharide polymers” is understood to mean polymers that do not contain a glycoside bond between monosaccharides. As used herein, the term “cationic polymer” denotes any polymer containing cationic groups and/or groups that may be ionized into cationic groups. In one embodiment, the cationic polymers may be chosen from those comprising units comprising primary, secondary, tertiary, and/or quaternary amine groups that either may form part of the main polymer chain or may be borne by a side substituent directly attached thereto. The cationic polymers may have a number-average molecular mass ranging from 500 to 5×106, for example, from 103 to 3×106. Examples of cationic polymers include, but are not limited to, polymers of the polyamine, polyamino amide, and polyquaternary ammonium type, all of which are known products. X is an anion derived from a mineral or organic acid, for example, a methosulfate anion and a halide such as chloride and bromide. The copolymers of family (1) may also comprise at least one unit derived from comonomers which may be chosen from acrylamides, methacrylamides, diacetone acrylamides, acrylamides and methacrylamides substituted on the nitrogen with lower (C1-C4) alkyls, acrylic and methacrylic acids and esters thereof, vinyllactams such as vinylpyrrolidone and vinylcaprolactam, and vinyl esters. quaternized vinylpyrrolidone/dimethylaminopropylmethacrylamide copolymers, such as the product sold under the name Gafquat HS 100 by the company ISP. (2) Polymers comprising piperazinyl units and of divalent alkylene or hydroxyalkylene radicals comprising straight or branched chains, optionally interrupted by at least one entity chosen from oxygen, sulfur, and nitrogen atoms, and from aromatic rings and heterocyclic rings, as well as the oxidation and/or quaternization products of these polymers. Such polymers are described, for example, in French Patent Nos. 2 162 025 and 2 280 361. (3) Water-soluble polyamino amides prepared, for example by polycondensation of an acidic compound with a polyamine; these polyamino amides may be crosslinked with an entity chosen from epihalohydrins, diepoxides, dianhydrides, unsaturated dianhydrides, bis-unsaturated derivatives, bis-halohydrins, bis-azetidiniums, bis-haloacyidiamines, bis-alkyl halides, and oligomers resulting from the reaction of a difunctional compound which is reactive with bis-halohydrins, bis-azetidiniums, bis-haloacyldiamines, bis-alkyl halides, epihalohydrins, diepoxides, and/or bis-unsaturated derivatives; the crosslinking agent being used in proportions ranging from 0.025 to 0.35 mol per amine group of the polyamino amide; these polyamino amides may be alkylated or, if they comprise one or more tertiary amine functions, they may be quaternized. Such polymers are described, for example, in French Patent Nos. 2 252 840 and 2 368 508. (4) The polyamino amide derivatives resulting from the condensation of polyalkylene polyamines with polycarboxylic acids followed by alkylation with difunctional agents. Examples of such polymers include, but are not limited to, adipic acid/dialkylaminohydroxy-alkyldialkylenetriamine polymers in which the alkyl radical comprises from 1 to 4 carbon atoms, for example, methyl, ethyl, and propyl. Such polymers are described, for example, in French Patent No. 1 583 363. Non-limiting examples of these derivatives are the adipic acid/dimethylamino-hydroxypropyl/diethylenetriamine polymers sold under the name Cartaretine F, F4, and F8 by the company Sandoz. (5) The polymers obtained by reaction of a polyalkylene polyamine comprising two primary amine groups and at least one secondary amine group with a dicarboxylic acid chosen from diglycolic acid and saturated aliphatic dicarboxylic acids comprising from 3 to 8 carbon atoms. The molar ratio between the polyalkylene polyamine and the dicarboxylic acid may range from 0.8:1 to 1.4:1; the polyamino amide resulting therefrom being reacted with epichlorohydrin in a molar ratio of epichlorohydrin relative to the secondary amine group of the polyamino amide ranging from 0.5:1 to 1.8:1. Such polymers are described, for example, in U.S. Pat. Nos. 3,227,615 and 2,961,347. Polymers of this type are sold, for example, under the name Hercosett 57 by the company Hercules Inc. and under the name PD 170 or Delsette 101 by the company Hercules in the case of the adipic acid/epoxypropyl/diethylenetriamine copolymer. Y− is an anion such as bromide, chloride, acetate, borate, citrate, tartrate, bisulfate, bisulfite, sulfate, and phosphate. These polymers are described, for example, in French Patent No. 2 080 759 and in its Certificate of Addition 2 190 406. In at least one embodiment, R10 and R11, which may be identical or different, may be chosen from alkyl groups comprising from 1 to 4 carbon atoms. Further examples of the polymers defined above include, but are not limited to, the dimethyldiallylammonium chloride homopolymer sold under the name Merquat 100 by the company Nalco (and its homologues of low weight-average molecular mass) and the copolymers of diallyldimethylammonium chloride and of acrylamide, sold under the name Merquat 550.
d) ureylene groups of formula: —NH—CO—NH—. In at least one embodiment, X− may be an anion such as chloride or bromide. These polymers generally may have a number-average molecular mass ranging from 1000 to 100 000. Polymers of this type are described, for example, in French Patent Nos. 2 320 330, 2 270 846, 2 316 271, 2 336 434 and 2 413 907 and U.S. Pat. Nos. 2,273,780, 2,375,853, 2,388,614, 2,454,547, 3,206,462, 2,261,002, 2,271,378, 3,874,870, 4,001,432, 3,929,990, 3,966,904, 4,005,193, 4,025,617, 4,025,627, 4,025,653, 4,026,945, and 4,027,020. X− is an anion derived from a mineral or organic acid. A non-limiting example of a compound of formula (a) is the compound for which R1, R2, R3, and R4 are methyl radicals, n=3, p=6, and X═Cl, referred to as hexadimethrine chloride according to the INCI nomenclature (CTFA). A is chosen from dihalide radicals and —CH2—CH2—O—CH2—CH2—. Such compounds are described, for example, in European Patent Application No. 0 122 324. Examples of commercial products include Mirapol® A 15, Mirapol® AD1, Mirapol® AZ1, and Mirapol® 175 sold by the company Miranol. (9) Quaternary polymers of vinylpyrrolidone and of vinylimidazole, for example, the products sold under the names Luviquat® FC 905, FC 550, and FC 370 by the company BASF. (10) Crosslinked methacryloyloxy(C1-C4)alkyltri(C1-C4)alkylammonium salt polymers such as the polymers obtained by homopolymerization of dimethylaminoethyl methacrylate quaternized with methyl chloride, or by copolymerization of acrylamide with dimethylaminoethyl methacrylate quaternized with methyl chloride, the homo- or copolymerization being followed by crosslinking with a compound containing olefinic unsaturation, in particular methylenebisacrylamide. Examples of such compounds include, but are not limited to, the crosslinked acrylamide/methacryloyloxyethyltrimethylammonium chloride copolymer (20/80 by weight) in the form of a dispersion containing 50% by weight of the said copolymer in mineral oil, sold, for example, under the name Salcare® SC 92 by the company Ciba; and the crosslinked methacryloyloxyethyltrimethylammonium chloride homopolymer containing about 50% by weight of the homopolymer in mineral oil or in a liquid ester, sold, for example, under the names Salcare® SC 95 and Salcare® SC 96 by the company Ciba. Other examples of cationic polymers that can be used in accordance with the present disclosure are cationic proteins and cationic protein hydrolysates, polyalkyleneimines, for example, polyethyleneimines, polymers comprising vinylpyridine or vinylpyridinium units, condensates of polyamines and of epichlorohydrin, quaternary polyureylenes, and chitin derivatives. In at least one embodiment, the cationic polymers may be chosen from cationic cyclopolymers, for example, the dimethyidiallylammonium chloride homopolymers and copolymers sold under the names Merquat 100, Merquat 550, and Merquat S by the company Nalco, and quaternary vinylpyrrolidone and vinylimidazole polymers, and mixtures thereof. The silicones that may be used in accordance with the present disclosure include, for example, polyorganosiloxanes that are insoluble in the composition and that may be in the form of oils, waxes, resins, or gums. The organopolysiloxanes are defined in greater detail, for example, in Walter Noll's “Chemistry and Technology of Silicones” (1968) Academic Press. These organopolysiloxanes may be volatile or non-volatile. (i) cyclic silicones comprising from 3 to 7, for instance, from 4 to 5 silicon atoms. These include, for example, octamethylcyclotetrasiloxane sold, for instance, under the name Volatile Silicone 7207 by Union Carbide and Silbione 70045 V 2 by Rhodia Chimie, decamethylcyclopentasiloxane sold under the name Volatile Silicone 7158 by Union Carbide, and Silbione 70045 V 5 by Rhodia Chimie, and mixtures thereof. (ii) linear volatile silicones comprising from 2 to 9 silicon atoms and having a viscosity of less than or equal to 5×10−6 m2/s at 25° C. A non-limiting example of such a compound is decamethyltetrasiloxane sold, for example, under the name SH 200 by the company Toray Silicone. Silicones belonging to this category are also described in the article published in Cosmetics and Toiletries, Vol. 91, January 76, pp. 27-32, Todd & Byers “Volatile Silicone Fluids for Cosmetics”. In at least one embodiment, non-volatile silicones, for example, polyalkylsiloxanes, polyarylsiloxanes, polyalkylarylsiloxanes, silicone gums and resins, polyorganosiloxanes modified with organofunctional groups, and mixtures thereof, may be used in the compositions disclosed herein. 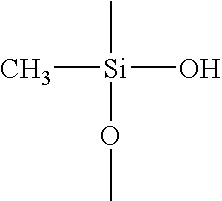 These silicones may be chosen from polyalkylsiloxanes, for example, polydimethylsiloxanes comprising trimethylsilyl end groups having a viscosity of from 5×10−6 to 2.5 m2/s at 25° C., for example, from 1×10−5 to 1 m2/s. The viscosity of the silicones is measured, for example, at 25° C. according to ASTM standard 445 Appendix C.
the Viscasil oils from General Electric and certain oils of the SF series (SF 96, SF 18) from General Electric. Further examples include, but are not limited to, polydimethylsiloxanes comprising dimethylsilanol end groups (Dimethiconol according to the CTFA name) such as the oils of the 48 series from the company Rhodia Chimie. Suitable compounds in this category of polyalkylsiloxanes, include, for example, the products sold under the names Abil Wax 9800 and 9801 by the company Goldschmidt, which are poly(C1-C20)alkylsiloxanes. The polyalkylarylsiloxanes may be chosen from linear and/or branched polydimethylmethylphenylsiloxanes and polydimethyldiphenylsiloxanes having a viscosity ranging from 1×10−5 to 5×10−2 m2/s at 25° C.
oils of the SF series from General Electric, such as SF 1023, SF 1154, SF 1250, and SF 1265. Silicone gums that can be used in accordance with the present disclosure may include, for example, polydiorganosiloxanes with high number-average molecular masses ranging from 200 000 to 1 000 000, used alone or as a mixture in a solvent. This solvent may be chosen from volatile silicones, polydimethylsiloxane (PDMS) oils, polyphenylmethylsiloxane (PPMS) oils, isoparaffins, polyisobutylenes, methylene chloride, pentane, dodecane, tridecane, and mixtures thereof. mixtures of two PDMSs with different viscosities, for example, of a PDMS gum and a PDMS oil, such as the product SF 1236 from the company General Electric. The product SF 1236 is a mixture of an SE 30 gum defined above, having a viscosity of 20 m2/s, and an SF 96 oil, with a viscosity of 5×10−6 m2/s. In at least one embodiment, this product may comprise 15% SE 30 gum and 85% SF 96 oil. R2SiO2/2, R3SiO1/2, RSiO3/2, and SiO4/2. in which R is chosen from hydrocarbon-based groups comprising from 1 to 16 carbon atoms and phenyl groups. Examples of these products include, but are not limited to, those in which R is chosen from C1-C4 lower alkyl radicals, for example, methyl and phenyl radicals. These resins may also include, for example, the product sold under the name Dow Corning 593 and those sold under the names Silicone Fluid SS 4230 and SS 4267 by the company General Electric, which are silicones of dimethyl/trimethyl siloxane structure. Further examples of resins include, but are not limited to, the trimethyl siloxysilicate type resins sold, for example, under the names X22-4914, X21-5034, and X21-5037 by the company Shin-Etsu. The organomodified silicones that can be used in accordance with the present disclosure may be silicones as defined above and may comprise in their structure at least one organofunctional group attached via a hydrocarbon-based radical. hydroxyacylamino groups, such as the polyorganosiloxanes described in European Patent Application No. 0 342 834, for example, of the product Q2-8413 from the company Dow Corning. The composition according to the present disclosure may also comprise silicones comprising a polysiloxane portion and a portion comprising a non-silicone organic chain, one of the two portions constituting the main chain of the polymer, the other being grafted onto the main chain. These polymers are described, for example, in European Patent Application Nos. 0 412 704, 0 412 707, 0 640 105, and 0 582 152, International Patent Application Publication Nos. WO 95/00578 and WO 93/23009, and U.S. Pat. Nos. 4,693,935, 4,728,571, and 4,972,037. In at least one embodiment, these polymers may be anionic or nonionic. wherein v is a number ranging from 5 to 700; the weight percentages being calculated relative to the total weight of the monomers. Other examples of grafted silicone polymers include, for example, polydimethylsiloxanes (PDMS) onto which are grafted, via a connecting chain unit of thiopropylene type, mixed polymer units of poly(meth)acrylic acid type and of polyalkyl(meth)acrylate type and polydimethylsiloxanes (PDMS) onto which are grafted, via a connecting chain unit of thiopropylene type, polymer units of polyisobutyl(meth)acrylate type. According to one embodiment of the present disclosure, all of the silicones may be used in the form of emulsions, nanoemulsions, or microemulsions. polysiloxanes comprising amine groups, such as amodimethicones and trimethylsilylamodimethicones. protein hydrolysates bearing, on the polypeptide chain, quaternary ammonium groups comprising at least one alkyl radical comprising from 1 to 18 carbon atoms. Crotein Q in which the quaternary ammonium groups comprise at least one alkyl group comprising from 1 to 18 carbon atoms. These various products are sold, for example, by the company Croda. R6 is an alkylene group comprising from 1 to 6 carbon atoms. Non-limiting examples of such compounds include the products sold by the company Inolex under the name Lexein QX 3000, referred to in the CTFA dictionary as “Cocotrimonium Collagen Hydrolysate”. Further examples of quaternized proteins or hydrolysates include quaternized plant proteins such as wheat, corn, and soybean proteins. Suitable quaternized wheat proteins include, for example, those sold by the company Croda under the names Hydrotriticum WQ and QM, referred to in the CTFA dictionary as “Cocodimonium Hydrolysed Wheat Protein”, Hydrotriticum QL, referred to in the CTFA dictionary as “Lauridimonium Hydrolysed Wheat Protein”, and Hydrotriticum QS, referred to in the CTFA dictionary as “Steardimonium Hydrolysed Wheat Protein”. According to the present disclosure, the compounds of ceramide type may include, but are not limited to, natural or synthetic ceramides, glycoceramides, pseudoceramides, and/or neoceramides. 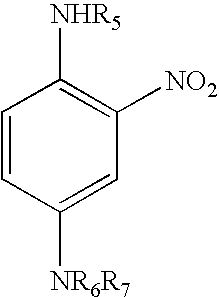 Compounds of ceramide type are described, for example, in German Patent Application Nos. 4 424 530, 4 424 533, 4 402 929, and 4 420 736, International Patent Application Publication Nos. WO 95/23807, WO 94/07844, WO 95/16665, WO 94/07844, WO 94/24097, and WO 94/10131, European Patent Application Nos. 0 646 572 and 0 227 994, and French Patent Application No. 2 673 179, the teachings of which are incorporated herein by reference. Cationic surfactants may also be used in accordance with the present disclosure, for example, optionally polyoxyalkylenated primary, secondary, or tertiary fatty amine salts; quaternary ammonium salts; imidazoline derivatives; and amine oxides of cationic nature. X− is an anion chosen from halides, phosphates, acetates, lactates, alkyl sulfates, alkyl sulfonates, and alkylaryl sulfonates. quaternary ammonium salts comprising at least one ester function. X− is a simple or complex, organic or inorganic anion; with the proviso that the sum x+y+z ranges from 1 to 15, that when x is 0, then R16 denotes R20, and that when z is 0, then R18 denotes R22. In one embodiment, the R15 alkyl radicals may be linear or branched. In another embodiment, the R15 radicals may be linear. The R15 radicals may be chosen from methyl, ethyl, hydroxyethyl, and dihydroxypropyl radicals. In one embodiment, the R15 radicals may be chosen from methyl and ethyl radicals. In another embodiment, the sum x+y+z may range from 1 to 10. When R16 is a hydrocarbon-based radical R20, it may be long and comprise from 12 to 22 carbon atoms, or short and comprise from 1 to 3 carbon atoms. When R18 is a hydrocarbon-based radical R22, it may comprise from 1 to 3 carbon atoms. In one embodiment, R17, R19, and R21, which may be identical or different, may be chosen from linear or branched, saturated or unsaturated C11-C21 hydrocarbon-based radicals, for example, linear or branched, saturated or unsaturated, C11-C21 alkyl and alkenyl radicals. In another embodiment, x and z, which may be identical or different, may be equal to 0 or 1, y may be equal to 1, and n, p, and r, which may be identical or different, may be equal to 2 or 3, for instance, equal to 2. The anion may be chosen from halides (for example, chloride, bromide, and iodide) and alkyl sulfates, for example, methyl sulfate. However, methanesulfonate, phosphate, nitrate, tosylate, an anion derived from an organic acid, such as acetate or lactate, or any other anion that is compatible with the ammonium containing an ester function, may be used. In one embodiment, the anion X− may be chosen from chloride and methyl sulfate. R17, R19, and R21, which may be identical or different, are chosen from linear or branched, saturated or unsaturated C13-C17 hydrocarbon-based radicals, for example, linear or branched, saturated or unsaturated C13-C17 alkyl and alkenyl radicals. In at least one embodiment, the hydrocarbon-based radicals may be linear. Examples that may be mentioned include the compounds of formula (XVI) such as the diacyloxyethyldimethylammonium, diacyloxyethylhydroxyethylmethyl-ammonium, monoacyloxyethyidihydroxyethylmethylammonium, triacyloxyethylmethylammonium, and monoacyloxyethylhydroxyethyidimethylammonium salts (for example, chloride and methyl sulfate), and mixtures thereof. The acyl radicals may comprise from 14 to 18 carbon atoms and may be obtained from a plant oil such as palm oil and sunflower oil. When the compound comprises several acyl radicals, these radicals may be identical or different. These products may be obtained, for example, by direct esterification of triethanolamine, triisopropanolamine, an alkyldiethanolamine, or an alkyldiisopropanolamine, which are optionally oxyalkylenated, with fatty acids or with fatty acid mixtures of plant or animal origin, or by transesterification of the methyl esters thereof. This esterification may be followed by a quaternization using an alkylating agent such as an alkyl halide (for example, methyl and ethyl halide), a dialkyl sulfate (for example, dimethyl and or diethyl sulfate), methyl methanesulfonate, methyl para-toluenesulfonate, glycol chlorohydrin, and glycerol chlorohydrin. Such compounds are sold, for example, under the names Dehyquart by the company Cognis, Stepanquat by the company Stepan, Noxamium by the company CECA, and Rewoquat WE 18 by the company Degussa. Ammonium salts comprising at least one ester function, such as those described in U.S. Pat. Nos. 4,874,554 and 4,137,180. Examples of quaternary ammonium salts of formula (XV), include, but are not limited to, tetraalkylammonium chlorides such as dialkyldimethylammonium chlorides and alkyltrimethylammonium chlorides, in which the alkyl radical comprises from 12 to 22 carbon atoms, for instance, behenyltrimethylammonium chloride, distearyidimethyl-ammonium chloride, cetyltrimethylammonium chloride, and benzyldimethylstearylammonium chloride, and stearamidopropyidimethyl(myristyl acetate)-ammonium chloride sold under the name Ceraphyl 70 by the company Van Dyk. The fatty acids may be chosen from myristic acid, palmitic acid, stearic acid, behenic acid, oleic acid, linoleic acid, linolenic acid, and isostearic acid. The fatty acid derivatives may be carboxylic acid esters, for example, mono-, di-, tri-, and tetracarboxylic esters. The monocarboxylic acid esters may include, for example, linear or branched, saturated or unsaturated C1-C26 aliphatic acid monoesters of linear or branched, saturated or unsaturated, C1-C26 aliphatic alcohols, the total carbon number of these esters being greater than or equal to 10. Examples of monoesters include, but are not limited to, dihydroabietyl behenate; octyidodecyl behenate; isocetyl behenate; cetyl lactate; C12-C15 alkyl lactate; isostearyl lactate; lauryl lactate; linoleyl lactate; oleyl lactate; (iso)stearyl octanoate; isocetyl octanoate; octyl octanoate; cetyl octanoate; decyl oleate; isocetyl isostearate; isocetyl laurate; isocetyl stearate; isodecyl octanoate; isodecyl oleate; isononyl isononanoate; isostearyl palmitate; methylacetyl ricinoleate; myristyl stearate; octyl isononanoate; 2-ethylhexyl isononate; octyl palmitate; octyl pelargonate; octyl stearate; octyldodecyl erucate; oleyl erucate; ethyl and isopropyl palmitates, 2-ethylhexyl palmitate, 2-octyldecyl palmitate, alkyl myristates such as isopropyl, butyl, cetyl, and 2-octyidodecyl myristate, hexyl stearate, butyl stearate, isobutyl stearate; dioctyl malate, hexyl laurate, 2-hexyldecyl laurate, isostearyl neopentanoate, and isodecyl neopentanoate. C4-C22 di- or tricarboxylic acid esters of C1-C22 alcohols and mono-, di- or tricarboxylic acid esters of C2-C26 di-, tri-, tetra-, or pentahydroxy alcohols may also be used in accordance with the present invention. Non-limiting examples of such esters include, diethyl sebacate; diisopropyl sebacate; diisopropyl adipate; di-n-propyl adipate; dioctyl adipate; diisostearyl adipate; dioctyl maleate; glyceryl undecylenate; octyidodecylstearoyl stearate; pentaerythrityl monoricinoleate; pentaerythrityl tetraisononanoate; pentaerythrityl tetrapelargonate; pentaerythrityl tetraisostearate; pentaerythrityl tetraoctanoate; propylene glycol dicaprylate dicaprate; tridecyl erucate; triisopropyl citrate; triisostearyl citrate; glyceryl trilactate; glyceryl trioctanoate; trioctyldodecyl citrate; and trioleyl citrate. In at least one embodiment, the esters may be chosen from ethyl and isopropyl palmitates, 2-ethylhexyl palmitate, 2-octyldecyl palmitate, alkyl myristates such as isopropyl, butyl, cetyl, and 2-octyldodecyl myristate, hexyl stearate, butyl stearate, isobutyl stearate; dioctyl malate, hexyl laurate, 2-hexyldecyl laurate, isononyl isononanoate, cetyl octanoate, isostearyl neopentanoate, and isodecyl neopentanoate. The fluoro oils include, for example, the perfluoropolyethers described, for instance, in European Patent Application No. 0 486 135, which is incorporated herein by reference in its entirety, and the fluorohydrocarbon compounds described, for example, in International Patent Application Publication No. WO 93/11103, which is incorporated herein by reference in its entirety. As used herein, the term “fluorohydrocarbon compounds” denotes compounds whose chemical structure contains a carbon skeleton in which certain hydrogen atoms have been replaced with fluorine atoms. The fluoro oils may also be fluorocarbons such as fluoroamines, for example, perfluorotributylamine; and fluorohydrocarbons, for instance, perfluorodecahydronaphthalene, fluoro esters, and fluoro ethers. Suitable perfluoropolyethers are sold, for example, under the trade names Fomblin by the company Montefluos and Krytox by the company Du Pont. Additional examples of fluorohydrocarbon compounds include fluorine-containing fatty acid esters such as the product sold under the name Nofable OF by the company Nippon Oil. In accordance with at least one embodiment of the present disclosure, a mixture of conditioning agents may also be used. According to the present disclosure, the at least one conditioning agent may be present in the composition in an amount ranging from 0.001% to 20% by weight, for example, from 0.01% to 10% by weight, or from 0.1% to 3% by weight, relative to the total weight of the final composition. The compositions of the present disclosure may comprise at least one surfactant, which may be present in the composition in an amount ranging from 0.1% to 60% by weight, for example, from 1% to 40%, or from 5% to 30%, relative to the total weight of the composition. The at least one surfactant may be chosen from anionic, amphoteric and nonionic surfactants, and mixtures thereof. In the context of the present disclosure, the nature of the anionic surfactant does not represent a truly critical factor. Thus, examples of anionic surfactants which can be used, alone or as mixtures, in the context of the present disclosure, include salts (for example, alkaline salts, sodium salts, ammonium salts, amine salts, amino alcohol salts, and magnesium salts) of alkyl sulfates, alkyl ether sulfates, alkylamido ether sulfates, alkylarylpolyether sulfates, monoglyceride sulfates; alkyl sulfonates, alkyl phosphates, alkylamide sulfonates, alkylaryl sulfonates, α-olefin sulfonates, paraffin sulfonates; alkyl sulfosuccinates, alkyl ether sulfosuccinates, alkylamide sulfosuccinates; alkyl sulfosuccinamates; alkyl sulfoacetates; alkyl ether phosphates; acyl sarcosinates; acyl isethionates, and N-acyltaurates, the alkyl or acyl radical of all of these various compounds comprising, for example, from 8 to 24 carbon atoms, and the aryl radical, in at least one embodiment, being chosen from phenyl and benzyl groups. Fatty acid salts may also be used as anionic surfactants, such as the salts of oleic, ricinoleic, palmitic and stearic acids, coconut oil acid, and hydrogenated coconut oil acid; and acyl lactylates in which the acyl radical comprises from 8 to 20 carbon atoms. Weakly anionic surfactants may also be used, such as alkyl-D-galactosiduronic acids and their salts, as well as polyoxyalkylenated (C6-C24) alkyl ether carboxylic acids, polyoxyalkylenated (C6-C24) alkylaryl ether carboxylic acids, polyoxyalkylenated (C6-C24) alkylamido ether carboxylic acids and their salts, for example, those comprising from 2 to 50 ethylene oxide groups, and mixtures thereof. In at least one embodiment of the present disclosure, the anionic surfactants may be chosen from alkyl sulfate salts, alkyl ether sulfate salts, and mixtures thereof. Nonionic surfactants are compounds that are generally well known in the art (see for example in this respect “Handbook of Surfactants” by M. R. Porter, published by Blackie & Son (Glasgow and London), 1991, pp. 116-178) and, in the context of the present disclosure, their nature is not a critical feature. Thus, they may be chosen, for example, from polyethoxylated, polypropoxylated, or polyglycerolated fatty acids, alkylphenols, α-diols, and alcohols having a fatty chain comprising, for example, from 8 to 18 carbon atoms, it being possible for the number of ethylene oxide or propylene oxide groups to range, for example, from 2 to 50, and for the number of glycerol groups to range, for example, from 2 to 30. Further examples of nonionic surfactants may include copolymers of ethylene oxide and of propylene oxide, condensates of ethylene oxide and of propylene oxide with fatty alcohols; polyethoxylated fatty amides having, for example, from 2 to 30 mol of ethylene oxide, polyglycerolated fatty amides containing on average from 1 to 5, for example, from 1.5 to 4, glycerol groups; oxyethylenated fatty acid esters of sorbitan having from 2 to 30 mol of ethylene oxide; fatty acid esters of sucrose, fatty acid esters of polyethylene glycol, alkylpolyglycosides, N-alkylglucamine derivatives, amine oxides such as (C10-C14)alkylamine oxides, and N-acylaminopropylmorpholine oxides. In at least one embodiment, the nonionic surfactants may be chosen from alkylpolyglycosides. The amphoteric surfactants, whose nature is not a critical feature in the context of the present disclosure, may be, for example, aliphatic secondary or tertiary amine derivatives in which the aliphatic radical is a linear or branched chain comprising from 8 to 22 carbon atoms and comprising at least one water-soluble anionic group (for example, carboxylate, sulfonate, sulfate, phosphate, and phosphonate). Suitable amphoteric surfactant may also include, for example, (C8-C20)alkylbetaines, sulfobetaines, (C8-C20)alkylamido(C1-C6)alkylbetaines, and (C8-C20)alkylamido(C1-C6)alkylsulfobetaines. R5 is chosen from alkyl radicals of an acid R5—COOH present in coconut oil or in hydrolysed linseed oil, alkyl radicals, for example, C7, C9, C11 and C13 alkyl radicals, C17 alkyl radicals and their iso forms, and unsaturated C17 radicals. These compounds are classified in the CTFA dictionary, 5th edition, 1993, under the names disodium cocoamphodiacetate, disodium lauroamphodiacetate, disodium caprylamphodiacetate, disodium capryloamphodiacetate, disodium cocoamphodipropionate, disodium lauroamphodipropionate, disodium caprylampho-dipropionate, disodium capryloamphodipropionate, lauroamphodipropionic acid, and cocoamphodipropionic acid. A non-limiting example of a suitable commercial product is the cocoamphodiacetate sold under the trade name Miranol C2M Concentrate by the company Rhodia Chimie. In at least one embodiment of the present disclosure, mixtures of surfactants may be used, for example, mixtures of anionic surfactants and mixtures of anionic surfactants and of amphoteric or nonionic surfactants. In another embodiment, the at least one surfactant is a mixture comprising at least one anionic surfactant and at least one amphoteric surfactant. or an amphoteric surfactant of zwitterionic type such as alkylbetaines, for example, the cocobetaine sold under the name Dehyton AB 30 as an aqueous solution containing 32% AM by the company Cognis. The composition of the present disclosure may also comprise at least one additive chosen from thickeners, fragrances, nacreous agents, preserving agents, anionic or nonionic polymers, non-cationic proteins, non-cationic protein hydrolysates, 18-methyleicosanoic acid, hydroxy acids, polymers other than those of the present disclosure, for example, polyether nonionic or cationic associative polyurethanes, and any other additive conventionally used in cosmetics that does not substantially affect the properties of the compositions according to the present disclosure. These additives may be present in the composition according to the present disclosure in amounts ranging from 0 to 20% by weight relative to the total weight of the composition. The precise amount of each additive is readily determined by a person skilled in the art, depending on its nature and its function. The compositions in accordance with the present disclosure may be used for washing and/or treating keratin fibers such as the hair. The compositions according to the present disclosure may be shampoos. In this embodiment of the present disclosure, the compositions may comprise a washing base, which is generally aqueous. The at least one surfactant forming the washing base may be chosen without preference, alone or as mixtures, from the anionic, amphoteric, and nonionic surfactants as defined above. The quantity and quality of the washing base are chosen so as to give the composition satisfactory foaming power and/or detergent power. Thus, according to the present disclosure, the washing base may be present in the composition in an amount ranging from 4% to 50% by weight, for example, from 6% to 35% by weight, or from 8% to 25% by weight relative to the total weight of the composition. In at least one embodiment, the washing base may comprise at least 3% by weight, for example, from 4% to 30% by weight of anionic surfactant relative to the total weight of the composition. The compositions of the present disclosure may also be in the form of leave-in or rinse-out hair conditioners; or in the form of a composition to be applied after dyeing, bleaching, permanent-waving and/or relaxing the hair, or alternatively, between the two steps of a permanent-waving or hair-relaxing operation. The compositions according to the present disclosure may be in the form of aqueous or aqueous-alcoholic haircare lotions. The cosmetic compositions according to the present disclosure may also be in the form of a gel, a milk, a cream, an emulsion, or a mousse, and may be used on the hair. The compositions may be packaged in various forms, for example, in vaporizers, pump-dispenser bottles, and in aerosol containers, in order to apply the composition in vaporized form or in the form of a mousse. Such packaging forms are indicated, for example, when it is desired to obtain a spray, a lacquer, or a mousse for treating the hair. The pH of the composition applied to the keratin fibers may generally range from 1 to 11. In at least one embodiment, the pH may range from 2 to 6, and may be adjusted to the desired value by means of acidifying or basifying agents that are well known in the prior art for compositions applied to keratin fibers. R38, R39, R40, and R41, which may be identical or different, are chosen from hydrogen, C1-C4 alkyl radicals, and C1-C4 hydroxyalkyl radicals. The acidifying agents may include, for example, mineral or organic acids, for instance hydrochloric acid, orthophosphoric acid, carboxylic acids, for instance tartaric acid, citric acid, and lactic acid, and sulfonic acids. Disclosed herein is a method for treating keratin fibers such as the hair, comprising applying to the keratin materials a cosmetic composition as defined above, and then in optionally rinsing with water. According to one embodiment, the compositions according to the present disclosure will be used as compositions for treating keratin fibers, for example, hair dyed by direct dyeing or oxidation dyeing. Also disclosed herein is a method for the post-treatment of an oxidation dyeing or direct dyeing operation on keratin fibers such as the hair, comprising applying to the keratin materials a cosmetic composition as defined above. Further disclosed herein is a method for dyeing keratin fibers comprising applying to the keratin fibers, such as the hair, a direct or oxidation dye composition (A) for a time that is sufficient to develop the color, and, after optionally rinsing and optionally drying, applying a composition (B) comprising a composition according to the present disclosure as defined above. As indicated above, the post-treatment composition according to the present disclosure may be applied immediately after dyeing, or the application may be delayed. As used herein, the term “delayed” means an application that takes place up to a few hours, one day, or several days (for example, from 1 to 60 days) after the dyeing operation. In at least one embodiment, several applications of the composition of the present disclosure may be performed between two colorations, for example, the number of applications between two colorations may range from 1 to 60, or from 2 to 30. The post-treatment composition may be used in rinse-out or leave-in mode, i.e., its application may or may not be followed by rinsing. In the first case, the leave-in time of the post-treatment composition may range from a few seconds to 90 minutes, for example, from 30 seconds to 20 minutes. The temperature at which the post-treatment composition is applied may range from 10° C. to 70° C., for example, from 10 to 60° C., or at room temperature. In accordance with the present disclosure, the nature and concentration of the dyes present in the dye compositions is not critical. In the case of lightening direct dyeing operations, the dye composition (A) may result from the mixing, at the time of use, of a dye composition (A1) comprising at least one direct dye and a composition (A2) comprising at least one oxidizing agent. In the case of oxidation dyeing, the dye composition (A) may result from the mixing, at the time of use, of a dye composition (A1) comprising at least one oxidation base and optionally at least one coupler and/or a direct dye and of a composition (A2) comprising at least one antioxidant. The direct dyes may be compounds that absorb light radiation in the visible range (400-750 nm). They may be chosen from nonionic, anionic, and cationic direct dyes. Generally, the direct dyes may be chosen from nitrobenzene dyes and azo, anthraquinone, naphthoquinone, benzoquinone, phenothiazine, indigoid, xanthene, phenanthridine, phthalocyanin, and triarylmethane-based dyes, and mixtures thereof. Examples of suitable nitrobenzene dyes include red and orange compounds, for instance, 1-hydroxy-3-nitro-4-N-(γ-hydroxypropyl)aminobenzene, N-(β-hydroxyethyl)amino-3-nitro-4-aminobenzene, 1-amino-3-methyl-4-N-(β-hydroxyethyl)amino-6-nitrobenzene, 1-hydroxy-3-nitro-4-N-(β-hydroxyethyl)-aminobenzene, 1,4-diamino-2-nitrobenzene, 1-amino-2-nitro-4-methylaminobenzene, N-(β-hydroxyethyl)-2-nitroparaphenylenediamine, 1-amino-2-nitro-4-(β-hydroxyethyl)amino-5-chlorobenzene, 2-nitro-4-aminodiphenylamine, 1-amino-3-nitro-6-hydroxybenzene, 1-(β-aminoethyl)amino-2-nitro-4-(β-hydroxyethyloxy)benzene, 1-(β,γ-dihydroxypropyl)oxy-3-nitro-4-(β-hydroxyethyl)aminobenzene, 1-hydroxy-3-nitro-4-aminobenzene, 1-hydroxy-2-amino-4,6-dinitrobenzene, 1-methoxy-3-nitro-4-(β-hydroxyethyl)aminobenzene, 2-nitro-4′-hydroxydiphenylamine, 1-amino-2-nitro-4-hydroxy-5-methylbenzene, and mixtures thereof. Other examples of nitrobenzene direct dyes include yellow and green dyes, for instance 1-β-hydroxyethyloxy-3-methylamino-4-nitrobenzene, 1-methylamino-2-nitro-5-(β, γ-dihydroxypropyl)oxybenzene, 1-(β-hydroxyethyl)amino-2-methoxy-4-nitrobenzene, 1-(β-aminoethyl)amino-2-nitro-5-methoxybenzene, 1,3-bis(β-hydroxyethyl)amino-4-nitro-6-chlorobenzene, 1-amino-2-nitro-6-methylbenzene, 1-(β-hydroxyethyl)amino-2-hydroxy-4-nitrobenzene, N-(β-hydroxyethyl)-2-nitro-4-trifluoromethylaniline, 4-(β-hydroxy-ethyl)amino-3-nitrobenzenesulfonic acid, 4-ethylamino-3-nitrobenzoic acid, 4-β-hydroxyethyl)amino-3-nitrochlorobenzene, 4-(β-hydroxyethyl)amino-3-nitromethyl-benzene, 4-(β,γ-dihydroxypropyl)amino-3-nitrotrifluoromethylbenzene, 1-(β-ureidoethyl)amino-4-nitrobenzene, 1,3-diamino-4-nitrobenzene, 1-hydroxy-2-amino-5-nitrobenzene, 1-amino-2-[tris(hydroxymethyl)methyl]amino-5-nitrobenzene, 1-(β-hydroxyethyl)amino-2-nitrobenzene, and 4-(β-hydroxyethyl)amino-3-nitrobenzamide. such as those described in French Patent No. 2 692 572. As is well known in the art, azo dyes are compounds comprising in their structure at least one —N═N— sequence not included in a ring; methine dyes are compounds comprising in their structure at least one —C═C— sequence not included in a ring; and azomethine dyes are compounds comprising in their structure at least one —C═N— sequence not included in a ring. A denoting an oxygen or nitrogen atom. The direct dyes may moreover be chosen from basic dyes such as those listed in the Color Index, 3rd edition, for example, under the names “Basic Brown 16”, “Basic Brown 17”, “Basic Yellow 57”, “Basic Red 76”, “Basic Violet 10”, “Basic Blue 26”, and “Basic Blue 99”; from the acidic direct dyes listed in the Color Index, 3rd edition, under the names “Acid Orange 7”, “Acid Orange 24”, “Acid Yellow 36”, “Acid Red 33”, “Acid Red 184”, “Acid Black 2”, “Acid Violet 43”, and “Acid Blue 62”, and cationic direct dyes such as those described in International Patent Application Publication Nos. WO 95/01772 and WO 95/15144 and European Patent No. 0 714 954, which are incorporated herein by reference in their entireties. When present, the at least one direct dye may be present in the composition in an amount ranging from 0.0005% to 12% by weight, for example, from 0.005% to 6% by weight relative to the total weight of the composition. The oxidation bases may be chosen from the oxidation bases conventionally used in oxidation dyeing, for example, para-phenylenediamines, bis(phenyl)alkylenediamines, para-aminophenols, ortho-aminophenols, and heterocyclic bases. Non-limiting examples of para-phenylenediamines include para-phenylene-diamine, para-tolylenediamine, 2-chloro-para-phenylenediamine, 2,3-dimethyl-para-phenylenediamine, 2,6-dimethyl-para-phenylenediamine, 2,6-diethyl-para-phenylenediamine, 2,5-dimethyl-para-phenylenediamine, N,N-dimethyl-para-phenylenediamine, N,N-diethyl-para-phenylenediamine, N,N-dipropyl-para-phenylenediamine, 4-amino-N,N-diethyl-3-methylaniline, N,N-bis(β-hydroxyethyl)-para-phenylenediamine, 4N,N-bis(β-hydroxyethyl)amino-2-methylaniline, 4-N,N-bis(β-hydroxyethyl)amino-2-chloroaniline, 2-β-hydroxyethyl-para-phenylenediamine, 2-fluoro-para-phenylenediamine, 2-isopropyl-para-phenylenediamine, N-(β-hydroxypropyl)-para-phenylenediamine, 2-hydroxymethyl-para-phenylenediamine, N,N-dimethyl-3-methyl-para-phenylenediamine, N-ethyl-N-(β-hydroxyethyl)-para-phenylenediamine, N-(β,γ-dihydroxypropyl)-para-phenylenediamine, N-(4′-aminophenyl)-para-phenylenediamine, N-phenyl-para-phenylenediamine, 2-β-hydroxyethyloxy-para-phenylenediamine, 2-β-acetyl-aminoethyloxy-para-phenylenediamine, N-(β-methoxyethyl)-para-phenylenediamine, and the acid addition salts thereof. In at least one embodiment, the para-phenylenediamines may be chosen from para-phenylenediamine, para-tolylenediamine, 2-isopropyl-para-phenylenediamine, 2-β-hydroxyethyl-para-phenylenediamine, 2-β-hydroxyethyloxy-para-phenylenediamine, 2,6-dimethyl-para-phenylenediamine, 2,6-diethyl-para-phenylenediamine, 2,3-dimethyl-para-phenylenediamine, N,N-bis(β-hydroxyethyl)-para-phenylenediamine, 2-chloro-para-phenylenediamine, 2-β-acetylaminoethyloxy-para-phenylenediamine, and the acid addition salts thereof. Suitable bis(phenyl)alkylenediamines include, for example, N,N′-bis(β-hydroxyethyl)-N,N′-bis(4′-aminophenyl)-1,3-diaminopropanol, N,N′-bis(β-hydroxyethyl)-N,N′-bis(4′-aminophenyl)ethylenediamine, N,N′-bis(4-aminophenyl)tetramethylenediamine, N,N′-bis(β-hydroxyethyl)-N,N′-bis(4-aminophenyl)tetramethylenediamine, N,N′-bis(4-methylaminophenyl)tetramethylenediamine, N,N′-bis(ethyl)-N,N′-bis(4′-amino-3′-methylphenyl) ethylenediamine, 1,8-bis(2,5-diaminophenoxy)-3,5-dioxaoctane, and the acid addition salts thereof with an acid. Examples of para-aminophenols include, but are not limited to, para-aminophenol, 4-amino-3-methylphenol, 4-amino-3-fluorophenol, 4-amino-3-hydroxymethylphenol, 4-amino-2-methylphenol, 4-amino-2-hydroxymethylphenol, 4-amino-2-methoxymethylphenol, 4-amino-2-aminomethylphenol, 4-amino-2-(β-hydroxyethylaminomethyl) phenol, 4-amino-2-fluorophenol, and the acid addition salts thereof. Non-limiting examples of ortho-aminophenols include 2-aminophenol, 2-amino-5-methylphenol, 2-amino-6-methylphenol, 5-acetamido-2-aminophenol, and the acid addition salts thereof. Suitable heterocyclic bases include, for example, pyridine derivatives, pyrimidine derivatives, and pyrazole derivatives. Pyridine derivatives may be chosen, for example, from the compounds described, for instance, in British Patent Nos. 1 026 978 and 1 153 196, as well as 2,5-di-aminopyridine, 2-(4-methoxyphenyl)amino-3-aminopyridine, 2,3-diamino-6-methoxypyridine, 2-(β-methoxyethyl)amino-3-amino-6-methoxypyridine, 3,4-diamino-pyridine, and the acid addition salts thereof. Examples of pyrimidine derivatives include, but are not limited to, the compounds described, for example, in German Patent No. 2 359 399; Japanese Patent Application No. 88-169 571; Japanese Patent No. 05-163 124; European Patent No. 0 770 375, and International Patent Application Publication No. WO 96/15765, such as 2,4,5,6-tetraaminopyrimidine, 4-hydroxy-2,5,6-triaminopyrimidine, 2-hydroxy-4,5,6-triaminopyrimidine, 2,4-dihydroxy-5,6-diaminopyrimidine and 2,5,6-triaminopyrimidine, and pyrazolopyrimidine derivatives such as those mentioned in French Patent Application No. 2 750 048, for example, pyrazolo[1,5-a]pyrimidine-3,7-diamine; 2,5-dimethylpyrazolo[1,5-a]pyrimidine-3,7-diamine; pyrazolo[1,5-a]pyrimidine-3,5-diamine; 2,7-dimethylpyrazolo[1,5-a]pyrimidine-3,5-diamine; 3-aminopyrazolo[1,5-a]pyrimidin-7-ol; 3-aminopyrazolo[1,5-a]pyrimidin-5-ol; 2-(3-aminopyrazolo[1,5-a]pyrimidin-7-ylamino) ethanol, 2-(7-aminopyrazolo[1,5-a]pyrimidin-3-ylamino)ethanol, 2-[(3-amino-pyrazolo[1,5-a]pyrimidin-7-yl)(2-hydroxyethyl)amino]ethanol, 2-[(7-aminopyrazolo[1,5-a]-pyrimidin-3-yl) (2-hydroxyethyl)amino]ethanol, 5,6-dimethylpyrazolo[1,5-a]pyrimidine-3,7-diamine, 2,6-dimethylpyrazolo[1,5-a]pyrimidine-3,7-diamine, 2,5,N7,N7-tetramethyl-pyrazolo[1,5-a]pyrimidine-3,7-diamine, 3-amino-5-methyl-7-imidazolylpropyl-aminopyrazolo[1,5-a]pyrimidine, the acid addition salts thereof, and the tautomeric forms thereof, when a tautomeric equilibrium exists. Non-limiting examples of pyrazole derivatives include the compounds described, for example, in German Patent Nos. 3 843 892 and 4 133 957, International Patent Application Publication Nos. WO 94/08969 and WO 94/08970, French Patent Application No. 2 733 749, and German Patent Application No. 195 43 988, such as 4,5-diamino-1-methylpyrazole, 4,5-diamino-1-(β-hydroxyethyl)pyrazole, 3,4-diamino-pyrazole, 4,5-diamino-1-(4′-chlorobenzyl)pyrazole, 4,5-diamino-1,3-dimethylpyrazole, 4,5-diamino-3-methyl-1-phenylpyrazole, 4,5-diamino-1-methyl-3-phenylpyrazole, 4-amino-1,3-dimethyl-5-hydrazinopyrazole, 1-benzyl-4,5-diamino-3-methylpyrazole, 4,5-diamino-3-tert-butyl-1-methylpyrazole, 4,5-diamino-1-tert-butyl-3-methylpyrazole, 4,5-diamino-1-(β-hydroxyethel)-3-methylpyrazole, 4,5-diamino-1-ethyl-3-methylpyrazole, 4,5-diamino-1-ethyl-3-(4′-methoxyphenyl)pyrazole, 4,5-diamino-1-ethyl-3-hydroxymethylpyrazole, 4,5-diamino-3-hydroxymethyl-1-methylpyrazole, 4,5-diamino-3-hydroxymethyl-1-isopropylpyrazole, 4,5-diamino-3-methyl-1-isopropylpyrazole, 4-amino-5-(2′-aminoethyl)amino-1,3-dimethyl-pyrazole, 3,4,5-triaminopyrazole, 1-methyl-3,4,5-triaminopyrazole, 3,5-diamino-1-methyl-4-methylaminopyrazole, 3,5-diamino-4-(β-hydroxyethyl)amino-1-methylpyrazole, and the acid addition salts thereof. When present, the at least one oxidation base may be present in the composition in an amount ranging from 0.0005% to 12% by weight, for example, from 0.005% to 6% by weight relative to the total weight of the dye composition. The oxidation dye compositions in accordance with the present disclosure may also comprise at least one coupler and/or at least one direct dye, for example, to modify the shades and/or to enrich them with tints. The at least one coupler may be chosen from the couplers conventionally used in oxidation dyeing, for example, meta-phenylenediamines, meta-aminophenols, meta-diphenols, naphthols, and heterocyclic couplers, for instance, indole derivatives, indoline derivatives, pyridine derivatives, indazole derivatives, pyrazolo[1,5-b]-1,2,4-triazole derivatives, pyrazolo[3,2-c]-1,2,4-triazole derivatives, benzimidazole derivatives, benzothiazole derivatives, benzoxazole derivatives, 1,3-benzodioxole derivatives, pyrazolones, and the acid addition salts thereof. Non-limiting examples of suitable couplers may include 2-methyl-5-aminophenol, 5-N-(β-hydroxyethyl)amino-2-methylphenol, 3-aminophenol, 1,3-dihydroxybenzene, 1,3-dihydroxy-2-methylbenzene, 4-chloro-1,3-dihydroxybenzene, 2,4-diamino-1-(β-hydroxyethyloxy)benzene, 2-amino-4-(β-hydroxyethylamino)-1-methoxybenzene, 1,3-diaminobenzene, 1,3-bis(2,4-diaminophenoxy)propane, sesamol, α-naphthol, 2-methyl-1-naphthol, 6-hydroxyindole, 4-hydroxyindole, 4-hydroxy-N-methyl-indole, 6-hydroxyindoline, 6-hydroxybenzomorpholine, 3,5-diamino-2,6-dimethoxy-pyridine, 1-N(β-hydroxyethyl)amino-3,4-methylenedioxy-benzene, 2,6-bis(β-hydroxy-ethylamino)toluene, 2,6-dihydroxy-4-methylpyridine, 1H-3-methylpyrazol-5-one, 1-phenyl-3-methylpyrazol-5-one, and the acid addition salts thereof. When present, the at least one coupler may be present in the composition in an amount ranging from 0.0001% to 10% by weight, for example, from 0.005% to 5% by weight relative to the total weight of the dye composition. The dye composition in accordance with the present disclosure may also contain various adjuvants conventionally used in hair dye compositions, such as anionic surfactants, cationic surfactants, nonionic surfactants, amphoteric surfactants, zwitterionic surfactants, and mixtures thereof; anionic polymers, cationic polymers, nonionic polymers, amphoteric polymers, zwitterionic polymers, and mixtures thereof; mineral thickeners; organic thickeners; antioxidants; penetrants; sequestrants; fragrances; buffers; dispersants; conditioning agents, for instance silicones; film-forming agents; preserving agents; and opacifiers. It is understood that a person skilled in the art will take care to select the at least one optional additional compound such that the advantageous properties intrinsically associated with the oxidation dye composition in accordance with the present disclosure are not, or are not substantially, adversely affected by the envisaged addition. The dye composition according to the present disclosure may be in various forms, such as in the form of liquids, creams or gels, or in any other form that is suitable for dyeing keratin fibers, such as human hair. In accordance with the present disclosure the nature of the oxidizing agent used in the lightening direct dyeing operation (direct dyeing with an oxidizing agent) or in the oxidation dyeing operation is not critical. The oxidizing agent may be chosen, for example, from hydrogen peroxide, urea peroxide, alkali metal bromates and ferricyanides, and persalts such as perborates and persulfates. The oxidizing agent may also be chosen from redox enzymes such as laccases, peroxidases, and two-electron oxidoreductases (such as uricase), where appropriate in the presence of the respective donor or cofactor thereof. c) at least one carboxylic acid or a salt thereof. Other than in the examples, or where otherwise indicated, all numbers expressing quantities of ingredients, reaction conditions, and so forth used in the specification and claims are to be understood as being modified in all instances by the term “about.” Accordingly, unless indicated to the contrary, the numerical parameters set forth in the specification and attached claims are approximations that may vary depending upon the desired properties sought to be obtained by the present invention. At the very least, and not as an attempt to limit the application of the doctrine of equivalents to the scope of the claims, each numerical parameter should be construed in light of the number of significant digits and ordinary rounding approaches. Notwithstanding that the numerical ranges and parameters setting forth the broad scope of the invention are approximations, unless otherwise indicated the numerical values set forth in the specific examples are reported as precisely as possible. Any numerical value, however, inherently contain certain errors necessarily resulting from the standard deviation found in their respective testing measurements. In the text hereinbelow and hereinabove, the percentages are expressed on a weight basis. By way of non-limiting illustration, concrete examples of certain embodiments of the present disclosure are given below. In the examples, AM means active material. 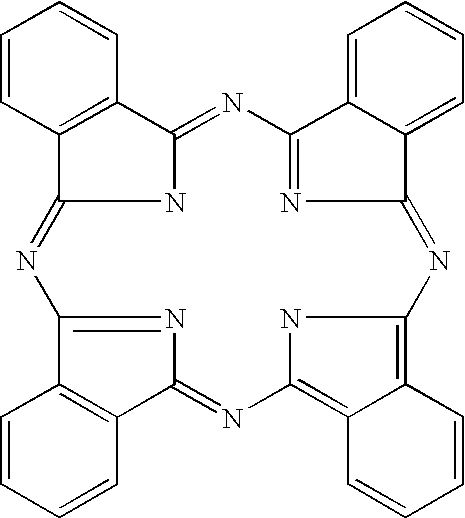 Permanent-waved hair was dyed blue using a dye composition described in Table 1 below, comprising an oxidation dyeing base: para-phenylenediamine, in equimolar combination with an oxidation dyeing coupler: 2,4-diaminophenoxyethanol. At the time of use, the above oxidation dye composition was mixed weight for weight with aqueous hydrogen peroxide solution (L'Oréal Professional 20-volumes aqueous hydrogen peroxide solution, containing 6% hydrogen peroxide). The mixture was then applied to locks of permanent-waved hair, at a rate of 10 g of dye mixture/g of lock. The leave-in time was 15 minutes on each side of the lock. The coloration was then stopped by rinsing with water followed by washing with a commercial shampoo (DOP camomile shampoo). The locks were then dried for 30 minutes at 60° C. under a drying hood. The compositions described in Table 2 were then applied to the dyed locks, 24 hours after the dyeing operation described above. To do this, the dyed locks were treated with the above compositions. The contact time was 10 minutes at a temperature of 45° C.
The treatment was followed by elimination shampooing with a commercial shampoo (DOP camomile shampoo). The locks were then dried for 30 minutes at 60° C. under a drying hood. The dyed and treated locks were then exposed to UV over half their length for a period of 40 hours by means of a solar simulator, Xenotest 150S. The other half of the lock was masked with a piece of card paper. The Xenotest 150S reproduces a reproducible light spectrum similar to that of sunlight via emission from an XE 1501 xenon arc lamp filtered with six infrared filters and a UV filter (UG11-black). The locks in rotation facing this radiation thus received an energy of 1250 W/m2 in a spectral range from 300 to 800 nm (UV+visible) under conditions of 30° C. temperature and 51.6% relative humidity. The degradation of the color after UV exposure was evaluated calorimetrically between the regions of masked and non-masked locks. The measurements were taken using a Minolta CM 2022 spectrocolorimeter 24 hours after dyeing and 24 hours after the 40 hours of UV exposure. It was observed that composition 1 according to the present disclosure containing benzoic acid showed better light-fastness of the color of the hair after 40 hours of UV exposure, compared with that obtained with composition 2 not containing benzoic acid. (c) at least one aromatic carboxylic acid chosen from benzene rings having at least one carboxylic acid function directly linked to the ring or a salt thereof, present in an amount ranging from about 0.1% to about 10% by weight relative to the total weight of the composition. 2. The composition of claim 1, wherein the aqueous medium comprises water and at least one organic solvent other than aromatic alcohols and aromatic carboxylic acids. 3. The composition of claim 2, wherein the at least one organic solvent is chosen from C1-C4 lower alcohols and polyols. 4. The composition of claim 3, wherein the at least one organic solvent is ethanol. 5. The composition of claim 1, wherein the organic UV-screening agents are chosen from water-soluble or liposoluble, silicone, or non-silicone screening agents. 6. The composition of claim 5, wherein the organic UV-screening agents are chosen from dibenzoylmethane derivatives; anthranilates; cinnamic derivatives; salicylic derivatives; benzylidenecamphor derivatives; benzophenone derivatives; β,β-diphenylacrylate derivatives; triazine derivatives; phenylbenzotriazole derivatives; benzalmalonate derivatives; phenylbenzimidazole derivatives; imidazolines; bis-benzazolyl derivatives; p-aminobenzoic acid (PABA) derivatives; benzoxazole derivatives; screening polymers and screening silicones; α-alkylstyrene-based dimers; 4,4-diarylbutadienes, and mixtures thereof. 9. The composition of claim 1, wherein the at least one protecting agent is soluble in the aqueous medium of the composition. 10. The composition of claim 9, wherein the at least one protecting agent has a log P (octanol/water partition coefficient) of less than 9. 11. The composition of claim 10, wherein the at least one protecting agent has a log P of less than 4. 12. The composition of claim 9, wherein the at least one protecting agent is soluble to at least 0.5% in water and C1-C4 lower alcohols at 25° C.
13. The composition of claim 1, wherein the at least one protecting agent is a water-soluble organic UV-screening agent. 14. 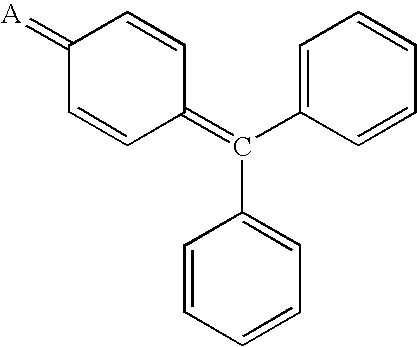 The composition of claim 13, wherein the water-soluble UV-screening agent is Benzophenone-4. 16. The composition of claim 15, wherein the at least one aromatic alcohol is benzyl alcohol. 18. The composition of claim 17, wherein the at least one aromatic carboxylic acid is benzoic acid. 19. The composition of claim 1, further comprising at least one conditioning agent. 20. The composition of claim 19, wherein the at least one conditioning agent is present in the composition in an amount ranging from 0.001% to 20% by weight relative to the total weight of the composition. 21. The composition of claim 20, wherein the at least one conditioning agent is present in the composition in an amount ranging from 0.01% to 10% by weight relative to the total weight of the composition. 22. The composition of claim 21, wherein the at least one conditioning agent is present in the composition in an amount ranging from 0.1% to 3% by weight relative to the total weight of the composition. 23. The composition of claim 1, further comprising at least one surfactant chosen from anionic, cationic, amphoteric, and nonionic surfactants. 24. The composition of claim 23, wherein the at least one surfactant is present in the composition in an amount ranging from 0.1% to 60% by weight relative to the total weight of the composition. 25. The composition of claim 24, wherein the at least one surfactant is present in the composition in an amount ranging from 1% to 40% by weight relative to the total weight of the composition. 26. The composition of claim 25, wherein the at least one surfactant is present in the composition in an amount ranging from 5% to 30% by weight relative to the total weight of the composition. 27. The composition of claim 1, wherein the composition is in the form of a shampoo and further comprises a washing base. 28. The composition of claim 27, wherein at least one surfactant forms the washing base and is present in the composition in an amount ranging from 4% to 50% by weight relative to the total weight of the composition. 29. The composition of claim 28, wherein the at least one surfactant forming the washing base is present in the composition in an amount ranging from 6% to 35% by weight relative to the total weight of the composition. 30. The composition of claim 29, wherein the at least one surfactant forming the washing base is present in the composition in an amount ranging from 8% to 25% by weight relative to the total weight of the composition. 31. The composition of claim 30, wherein the at least one surfactant forming the washing base is chosen from anionic surfactants and present in the composition in an amount of at least 3% by weight relative to the total weight of the composition. 32. The composition of claim 31, wherein the at least one surfactant forming the washing base is present in the composition in an amount ranging from 4% to 30% by weight relative to the total weight of the composition. 33. The composition of claim 1, wherein the composition is in the form of an aqueous or aqueous-alcoholic lotion, a gel, a milk, a cream, an emulsion, or a mousse. 34. The composition of claim 1, wherein the composition is packaged in a vaporizer, a pump-dispenser bottle, or in an aerosol container. 35. The composition of claim 1, wherein the composition is in the form of a rinse-out or leave-in hair conditioner or in the form of a composition to be applied to artificially dyed human hair after dyeing, bleaching, permanent-waving and/or relaxing the keratin fibers or between the two steps of a permanent-waving or hair-relaxing operation. 36. The composition of claim 1, wherein the pH of the composition ranges from 1 to 11. 37. The composition of claim 36, wherein the pH ranges from 2 to 6. (c) at least one aromatic carboxylic acid chosen from benzene rings haying at least one carboxylic acid function directly linked to the ring or a salt thereof, present in an amount ranging from about 0.1% to about 10% by weight relative to the total weight of the composition. 40. The method of claim 39, wherein the artificially dyed human hair is dyed by direct dyeing or by oxidation dyeing. FR2907333B1 (en) * 2006-10-24 2008-12-12 Oreal Use of a liquid aromatic acid ester to protect the color vis-a-vis the washing keratin fibers artificially dyed; coloring processes. FR2673179B1 (en) 1991-02-21 1993-06-11 Oreal Ceramides, their process for the preparation and their applications in cosmetics and dermopharmacy. FR2673839B1 (en) 1991-03-13 1993-07-16 Oreal Use of lactoferrin for protecting the keratin of the hair against atmospheric attack, especially light, and method of protecting the hair using this compound. DE4420736C1 (en) 1994-06-15 1995-08-10 Henkel Kgaa New pseudo-ceramide cpds. Anonymous, "The Use of UV Filters in Cosmetic and Pharmaceutical Sunscreen Formulations," IP Com Journal, 2002, pp. 1-35, New York, USA. Copending U.S. Appl. No. 11/476,076, filed Jun. 28, 2006, published as US2007/0056121 A1. Dorgan, P.D., "Waxes in Cosmetics," Drug and Cosmetic Industry, 133(6): 30-33 (1983). English language abstract for JP 5-043437, 1993. English language Abstract of EP 1 468 667, 2004. English language Abstract of JP 2001-213741, 2001. English language Derwent abstract for DE 100 51 773. English language Derwent abstract for DE 203 15 174 U1. English language Derwent abstract for DE 44 02 929. English language Derwent abstract for DE 44 11 856. English language Derwent abstract for DE 44 20 736. English language Derwent abstract for DE 44 24 530. English language Derwent abstract for DE 44 24 533. English language Derwent abstract for EP 0 080 976. English language Derwent abstract for EP 0 770 375. English language Derwent abstract for FR 2 589 476. English language Derwent abstract for FR 2 673 839. English language Derwent abstract for JP 2-19576. English language Derwent abstract for JP 5-163124. English language Derwent abstract for JP 5-43437. English language Derwent abstract for WO 93/04665. English language Derwent abstract for WO 95/23807. English language machine translation of DE 102 19 433 A1., 2003. English-language Abstract of FR 2795319 A1, 2000. European Opposition Proceedings, up to May 2, 2010, for Related Patent No. EP 1688127. European Search Report corresponding to EP 06 11 5282, dated Oct. 19, 2006. European Search Report for EP 05 29 2642, dated Apr. 26, 2005. French Search Report corresponding to FR 05/51794, dated Mar. 9, 2006. French Search Report for FR 05/50142, mailed Sep. 1, 2005 (corresponding to the present application). Office Action dated Jun. 24, 2010 for U.S. Appl. No. 11/476,076. Porter, M.R., Handbook of Surfactants, Blackie: Glasgow & London, pp. 116-178 (1991). Todd & Byers, "Volatile silicone fluids for cosmetics," Cosmetics & Toiletries 91: 27-32 (1976). Umbach: Entwicklung, Herstellung and Anwendung Kosmetischer Mitell: 2. Auflage (1995), Cited in European Opposition Proceedings for Related Patent No. EP 1688127. ES2299419T3 (en) 2008-06-01 Composition for the oxidation dyeing of keratinous fibers containing a thickening polymer comprising at least one fatty chain and mono- or polyglycerolated fatty alcohol. ES2281334T3 (en) 2007-10-01 Composition for the oxidation dyeing of keratinous fibers comprising a thickening polymer comprising at least one fatty chain and at least one fatty alcohol of more than twenty carbon atoms. ES2317422T3 (en) 2009-04-16 Dye composition with decreased content of raw materials, process for dyeing keratin fibers using this composition and device for the same.